Tile flooring is a long-lasting, durable choice for your home. In other words, it's something you'll be living with for years to come. It's worth taking some time to consider tile design trends to make sure you get something that you'll love now and ten years from now. Tile is a practical floor covering but that doesn't mean it can't be pretty too! Hard surface flooring such as tile has been a big trend in home flooring for the past few years and there's no end in sight. Hard surface floors are easy to maintain. They do not collect dust or mildew - making them great options for allergy sufferers. Tile is extremely durable and long lasting. It also comes in a wide range of styles to suit any home design. Large format tiles: Standard tiles are typically found in 6x6 or 12x12 sizes. More and more homeowners are thinking big and choosing 24x24 tiles for their floor taking even the most neutral of designs up a notch. Wood-look tile: Perhaps the hottest trend in tile flooring, porcelain tile that is designed to look like wood. The appearance of this tile is so realistic you might have to get down on your hands and knees to see the difference. Porcelain wood-like tile brings the look of wood into so many areas - think bathrooms and kitchens that aren't always wood friendly. This is a popular tile trend for good reason. Marble-look tile: Jumping on the "looks like something it's not" bandwagon is marble-look tile. Marble tile brings a timeless look to a room but it's so porous that it doesn't make the most practical floor. Enter porcelain tile! Porcelain tile designed to look like marble is a trend worth jumping on. Metallic accents: Metallic tiles are a newer look made more accessible by today's manufacturing techniques. Whether you choose bold and shiny or subtle and glowing, metallic tiles are a trend worth considering. 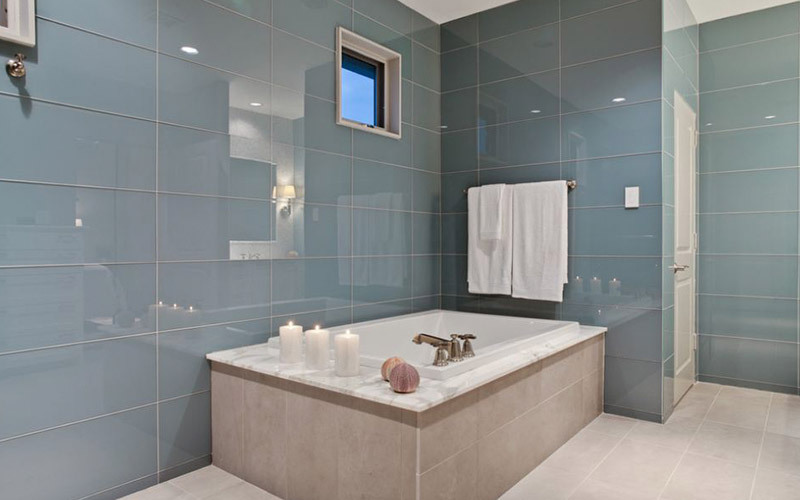 Gray tile: Gray flooring is a trend that is here to stay. And there are lots of ways to incorporate gray into your tile flooring from linen-look tile to gray wood-look tile to subtle patterns in different tile materials. Statement tile: One trend we're seeing more of this year is the desire to stand out a bit. Whether that's aqua tile in the bathroom or concrete-look tile in the kitchen - homeowners are looking to make a statement with their floor. As long as it's something that suits your personal taste and style, we say go for it! Learn more about types of tile. One of the hottest trends in tile isn't even on your floor... it's on your wall. A tile back splash in the kitchen and bathroom is a trend that's here to stay. While colorful glass mosaic black splashes are still quite popular, we're seeing more and more homeowners choose more interesting materials for a backsplash. Think metallic tile (or porcelain metal look-alike tile), terra cotta, or textile looks. You can take this trend beyond the backsplash with an accent wall that brings in beautiful colors and textures to your room. Geometric shapes and natural leaf shapes are a popular trend for wall tile features. These flooring trends are popular and a great way to expand your idea of what tile can look like in your home. Bottom line: pick the type of floor that's best for you. It's your home and your design preferences and whether it's one of these looks or something completely different, if it fits your style it's the best floor for you.